I am raising Diesel for Guiding Eyes for the Blind (www.guidingeyes.org). I have had him since he was 8 weeks old. We go to GEB classes (basic obedience and socialization) every 2 weeks. Diesel is formally evaluated - and videotaped - every quarter by the GEB regional coordinator. He goes back to GEB at 18 months for final testing before he enters training to be a guide dog. 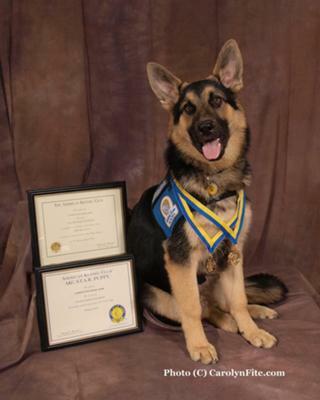 This picture was taken after Diesel passed both his AKC Star Puppy and Canine Good Citizen tests on the same night, 4 days before his 6 month birthday.